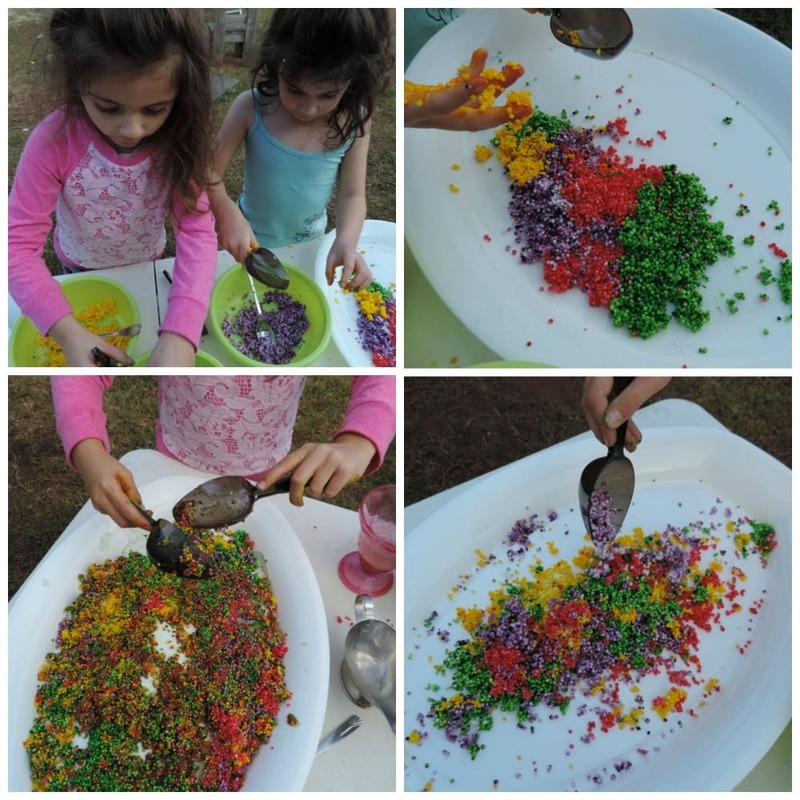 Make your own safe alternative to water beads for sensory play! 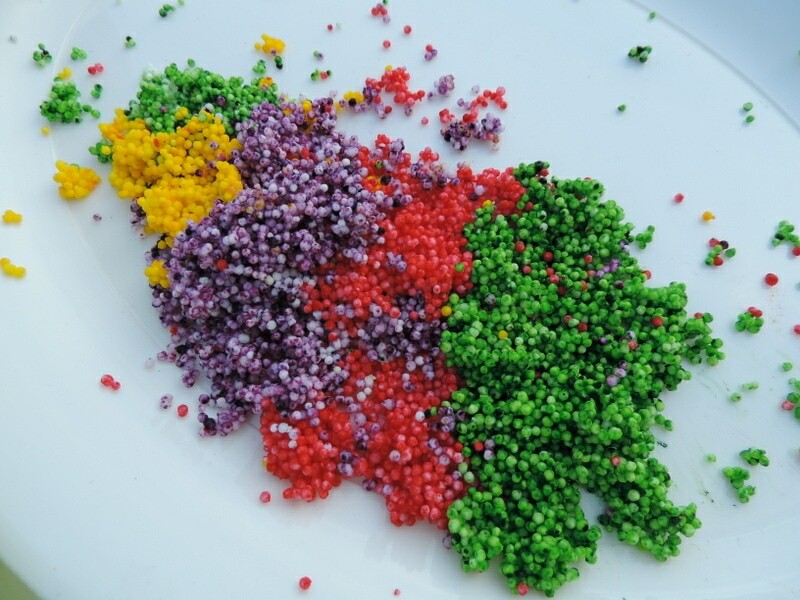 Today I’m sharing a play recipe that provides a water bead alternative! Why an alternative? 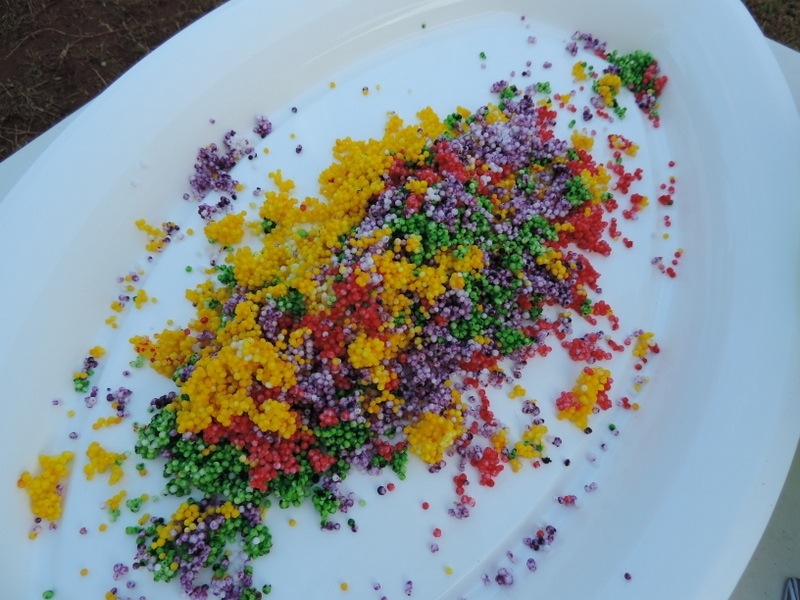 I’ve often looked at the activities on Pinterest with colourful water beads but the choking and general safety concerns around using these beads with young children has always made me avoid them as a safe sensory option. 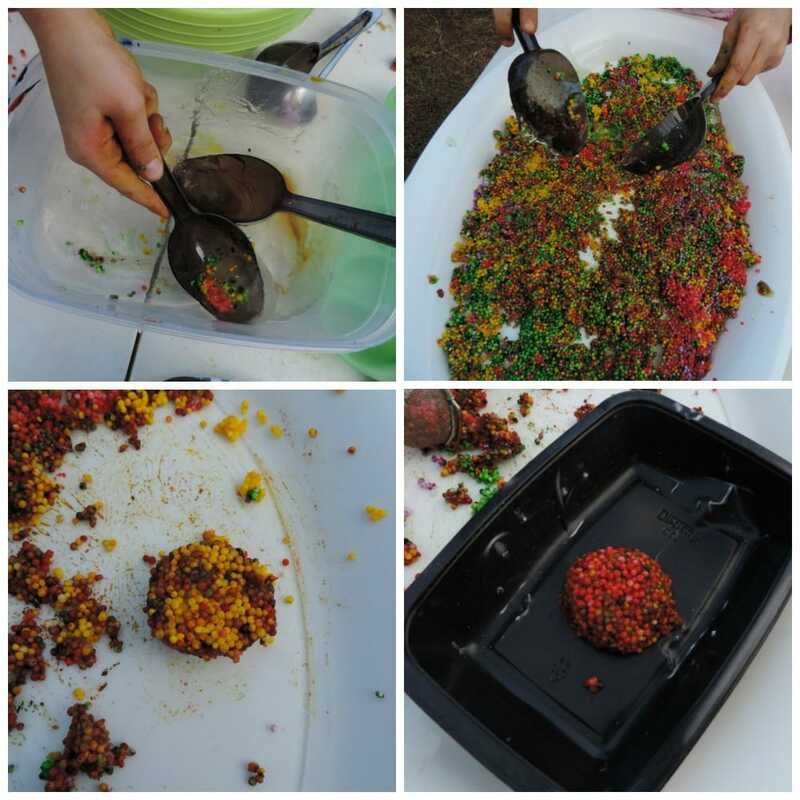 I really loved the sensory aspect to them though so I decided to try and make my own version of rainbow beads that I would feel comfortable allowing the children to really explore and create with. When His Patient Self came home from his work recently with a large damaged bag of dry sago balls that they could no longer sell I knew just what to do with them! You can buy small packets of sago balls which are quite small like you see in the picture below or you can buy slightly larger tapioca balls. Here in Australia they are usually made into a creamy dessert with milk – the balls swell when water or milk is added and they become slightly translucent. A little goes a long way! I used the equivalent weight of one small bag from the supermarket, poured the whole lot into a bowl, added just enough tepid water to cover and then left to soak overnight. In the morning you will see the water has been absorbed and the balls have swelled. It made enough to fill 4 mixing bowls! 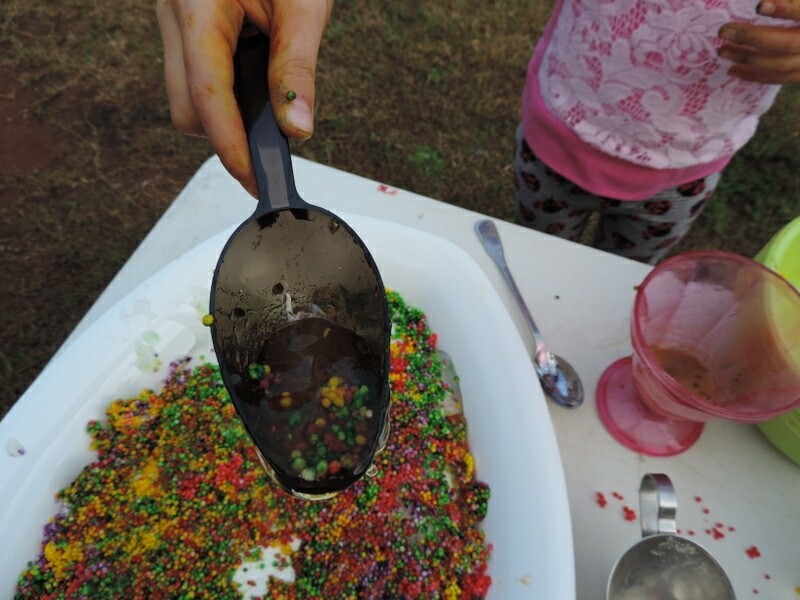 After setting them up on the outdoor table with scoops and spoons I sprinkled a little edicol powder paint dye into each bowl and then passed them over to my twins to stir and mix which is their favourite activity at the moment. 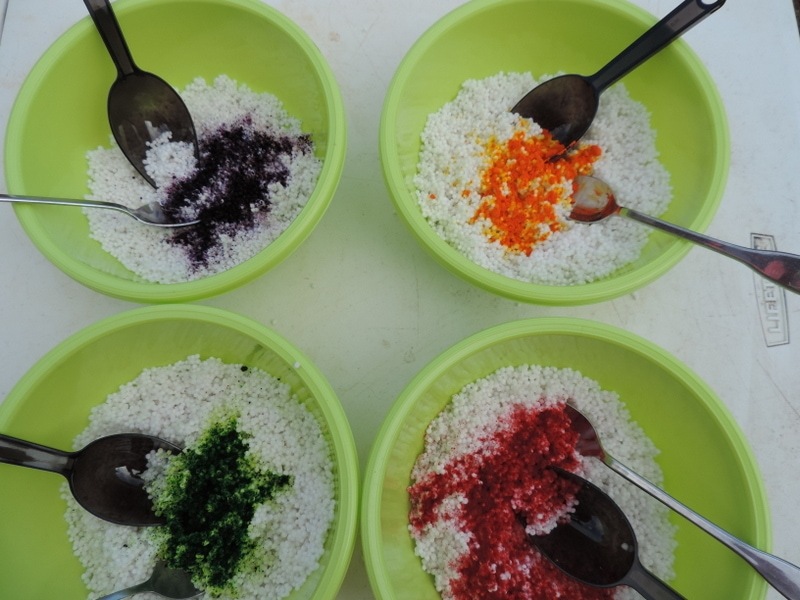 It makes a great colour mixing and recognition activity as well as giving some control of the activity to the children. They can clearly see the principle of cause and effect. Both girls immediately began to sniff the balls as they mixed through the colour and this led to an in depth Q&A session on what sago was, what it smelt like, how do we eat it and so many more. 5 year olds really do have an insatiable quest for knowledge! 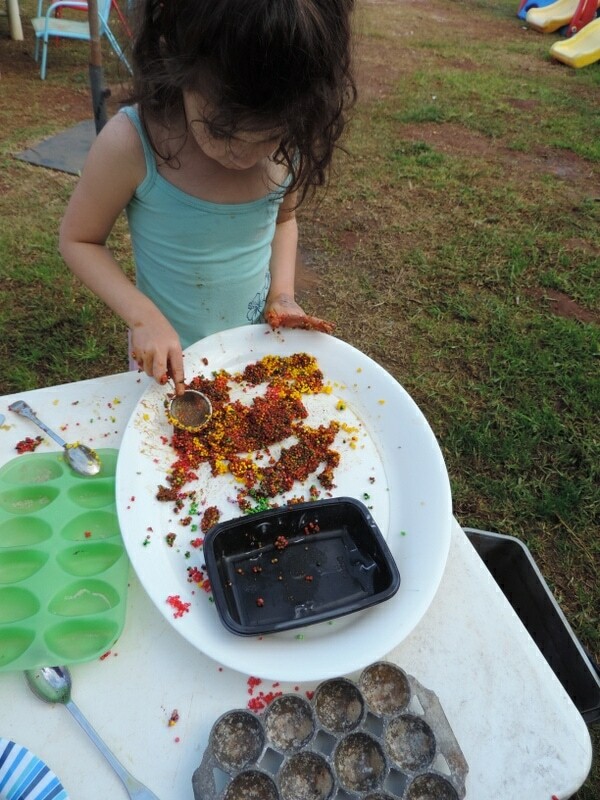 If you would prefer not to add colour it will make no difference whatsoever – the real learning outcome of this activity is the opportunity for sensory exploration. 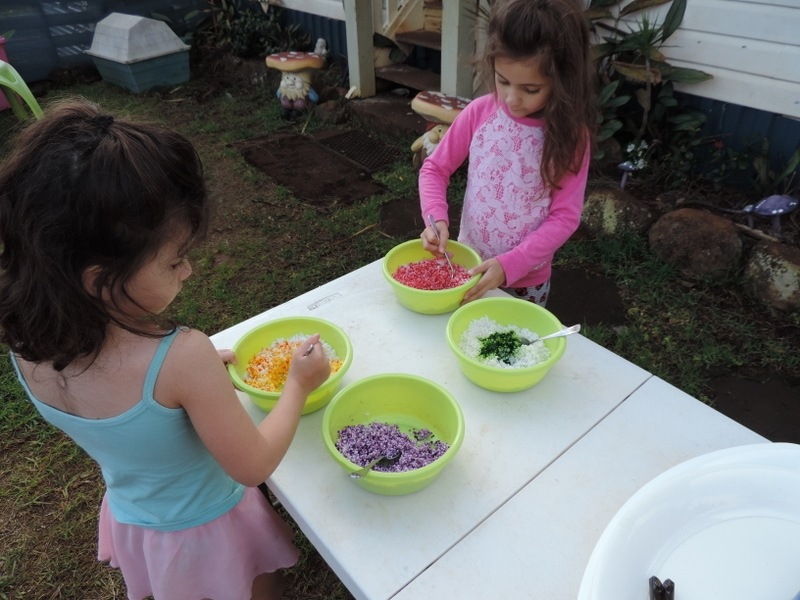 The girls transferred their coloured sago onto trays and began to make ‘Rainbows’, naming colours and arranging patterns as they went. Lots of opportunity to practice those fine motor and hand eye coordination skills with this activity. 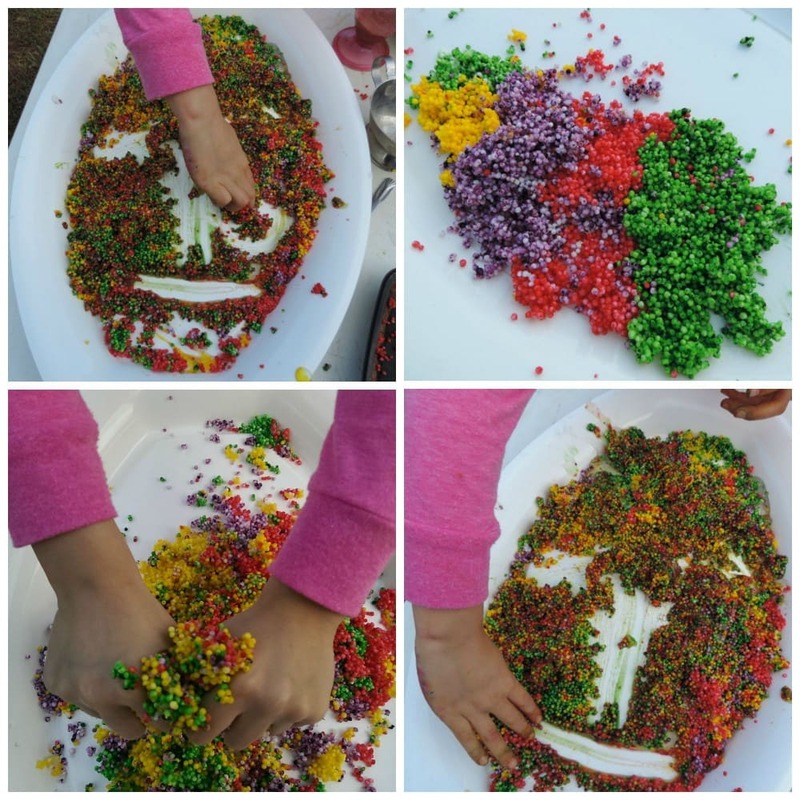 After they had had some fun with their rainbows I decided to extend the activity and challenge their senses a little by adding some clear cell mix paste (this is a little like wallpaper paste and very slippery) I had made up during the week for other activities. I often have these little brainwaves as I watch children playing – to me this is the true nature of ‘extending play’ and doesn’t always need to be planned in advance on paper! 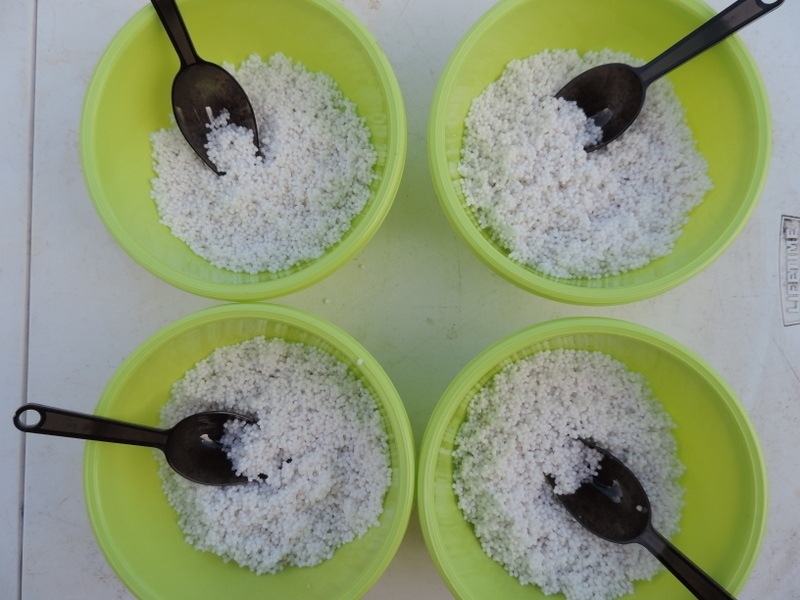 Cell-mix is simply a powder you sprinkle into a bowl of water and then whisk to get rid of lumps. It thickens and makes a lovely gooey paste which you can use as is or add colour to and use as paint. 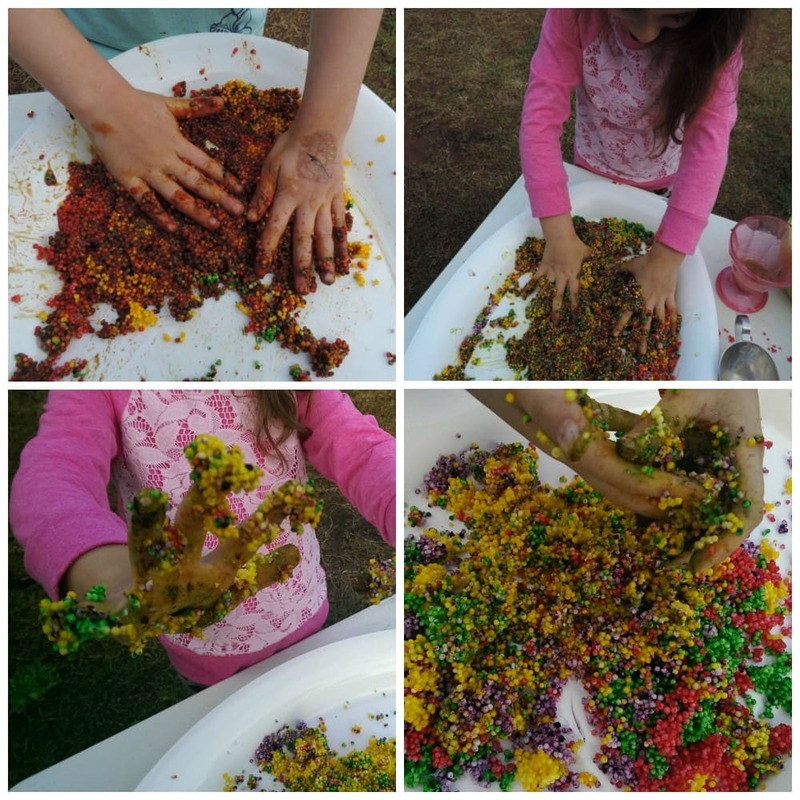 The girls immediately began scooping it up and then adding to their tray of rainbow sensory balls.Then it was time to use those senses and get messy! 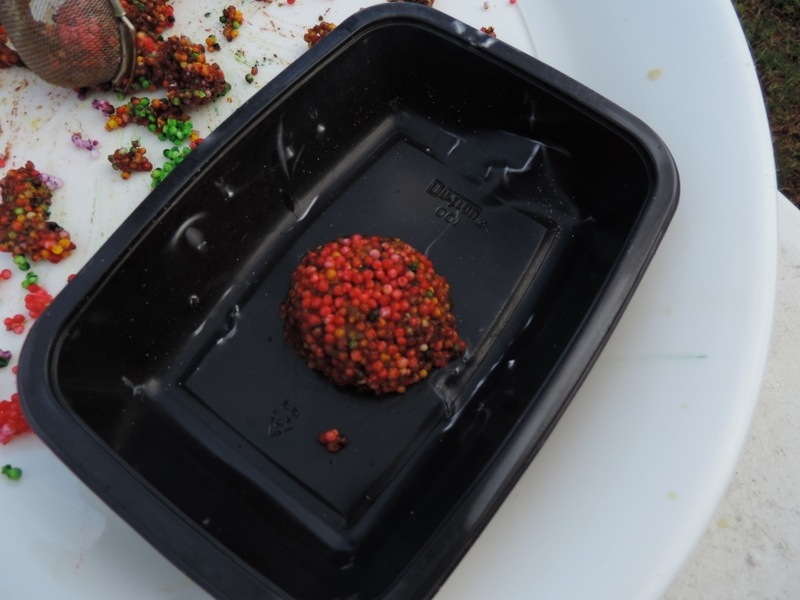 The cell mix gel turned the balls into a mouldable material and this caused great excitement. Suddenly the ideas were flowing and Tara showed me how she could write the letter T in her tray then squish it all up and start again! Ruby used the tea strainer to scoop and mould ‘cupcakes’. They held together really well and soon they were using the mini muffin trays to make their creations as well. As they added more and more gel to the balls and the mix became stickier and began to change colour the cooking was abandoned and and their hands became the tools of choice. They squished and mixed and marveled at the balls sticking to their hands and hair. 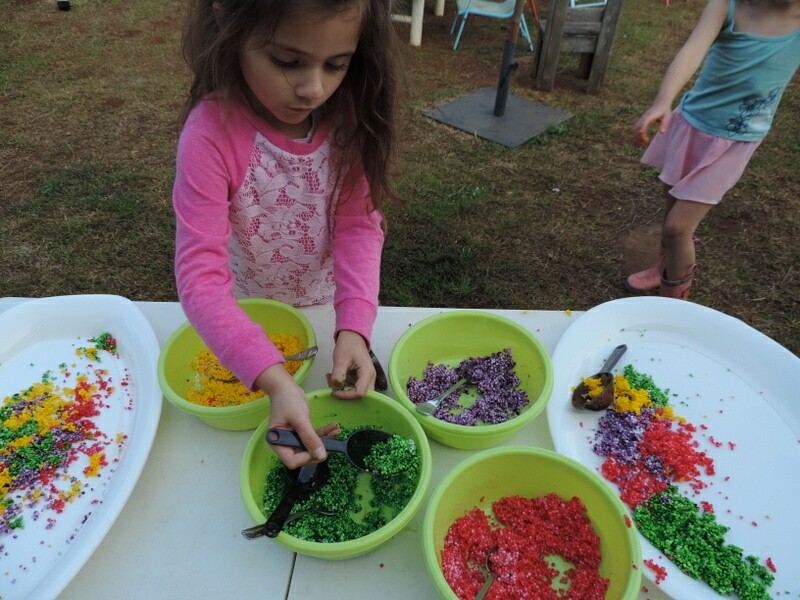 The rolled balls and drew patterns – it was a true sensory experience and I loved watching them! A word of warning.…my girls are very used to sensory activities like this as we have been doing them since they were babies but if you have a child who is sensitive to material on their hands just keep a bucket of water and cloth close by so they can wash their hands at regular intervals. Never force a sensitive child to engage in these type of activities but don’t stop exposing them either as one day they might just surprise you and it is important that they have the choice and can regularly see others playing safely in this way so make sure you get your hands sticky and messy too! On Pinterest? Why not pin the image below so you can refer back to this play recipe again when you need it! 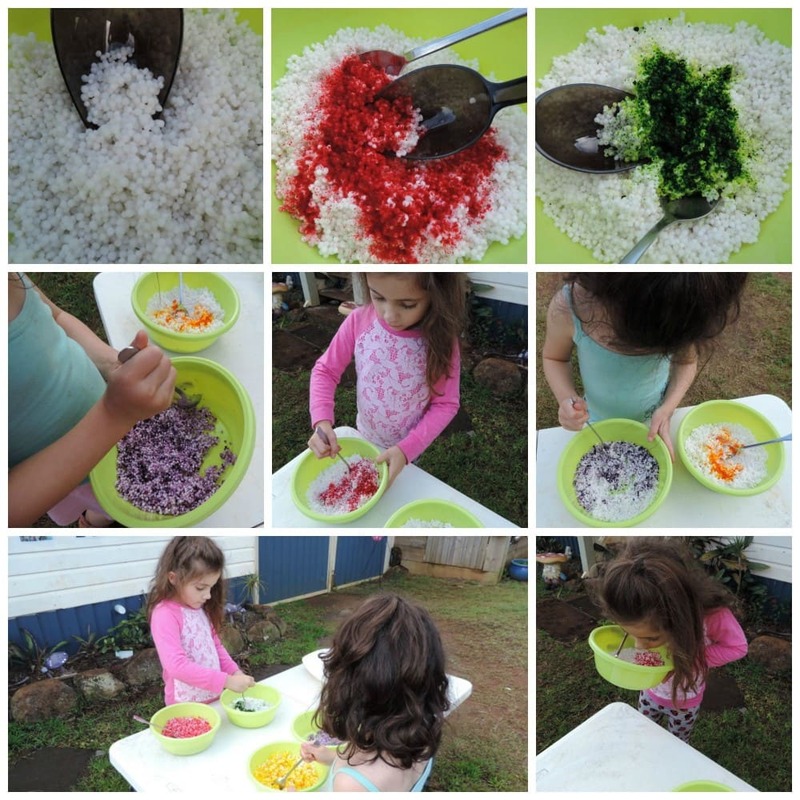 This activity is safe to use with babies and toddlers as sago balls are a food and able to be safely consumed. Edicol is a vegetable dye and will not harm either. You could use food colouring but just watch the amount you use as some children react to food colouring. They will not swell anymore after you have soaked them overnight so be sure to include younger children in this activity too! 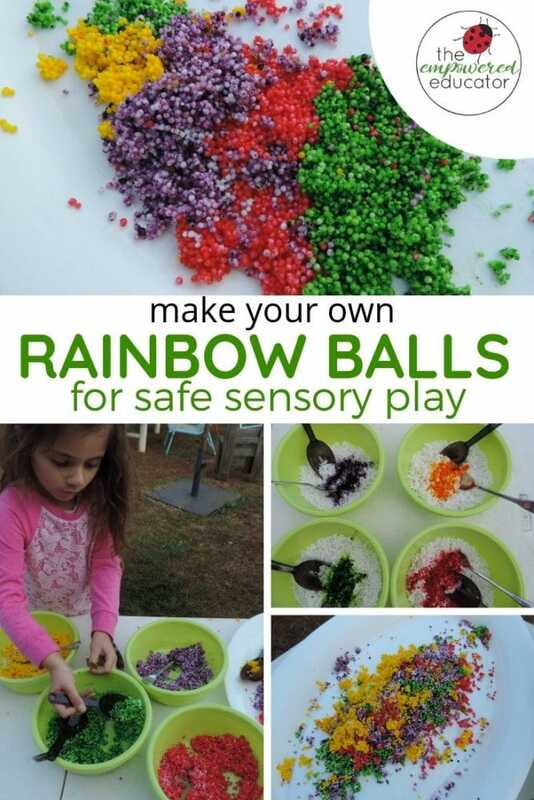 What would your children do with some rainbow sensory balls? Are you working in early childhood and want more ideas, inspiration and support? « How to become an assertive early years educator. Thank you for showing us this sensory activity. I too have often looked at water beads, and I did have some but never allowed the children to have them, something in my instinct said this could be dangerous. I am off to buy sago tomorrow. Have a lovely weekend. I use water beads in empty plastic bottles. They make A very interesting sensory bottle. 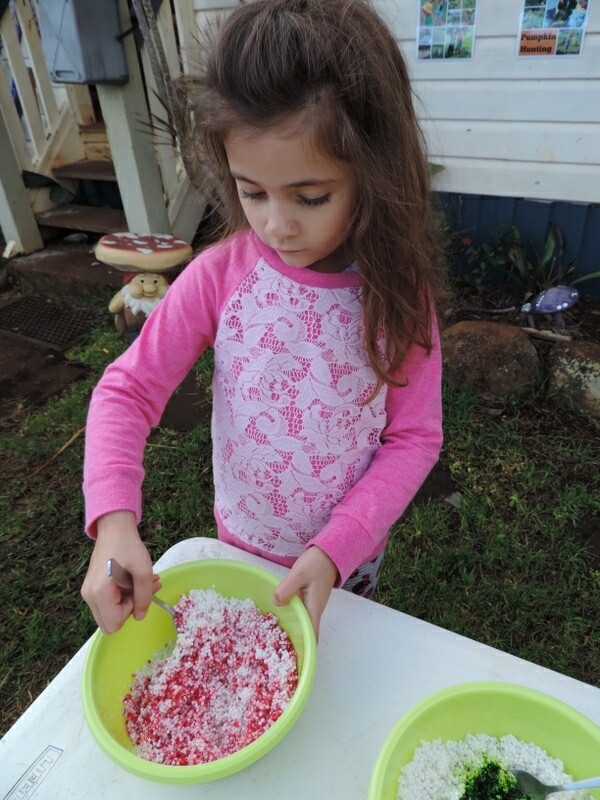 I have used tapioca with limited success….they were a sticky mess that no one seemed too interested in. ..I’ll try again. Where do you get the sago balls? This is very interesting. In Australia I just get them from our local Woolworths supermarket. They are in the aisle where the custard powder, jellies, yoghurt mixes, creamed rice etc is as they are actually a dessert made with milk and sugar usually. Hope that helps! 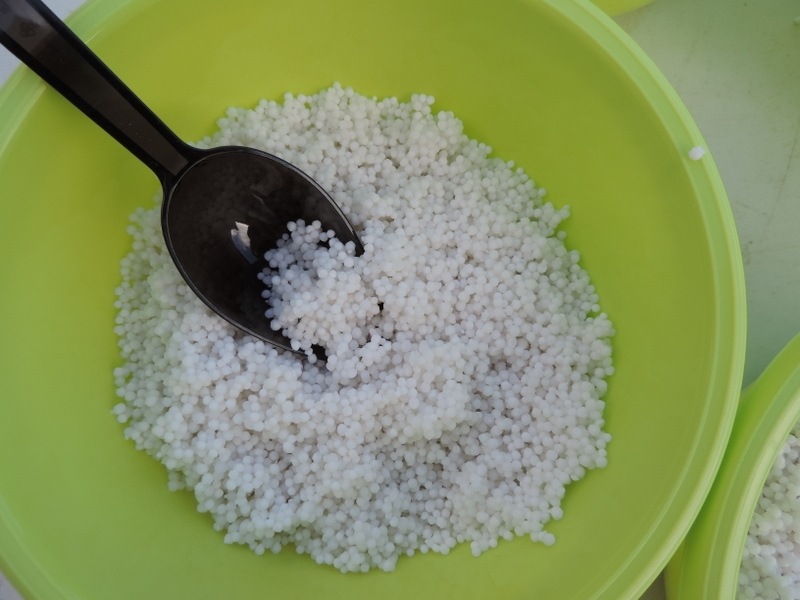 Perhaps in the us, sago could be swapped out for tapioca? Hi Cathy, definitely, they are pretty much the same thing…just a little bigger I think…enjoy! Where do you get the edible food dye, is it available in Woolworths? Hi Keryn, you can’t get the edicol dyes from Woolies or supermarkets, you can get them online through craft and educational suppliers quite easily though.However, you can also just use food colouring from the supermarket cooking aisle. They just aren’t as bright but will certainly do the job! How long can you keep these for? My two year old would love this activity but usually she only focuses for half hour or so, would you keep them in the fridge? 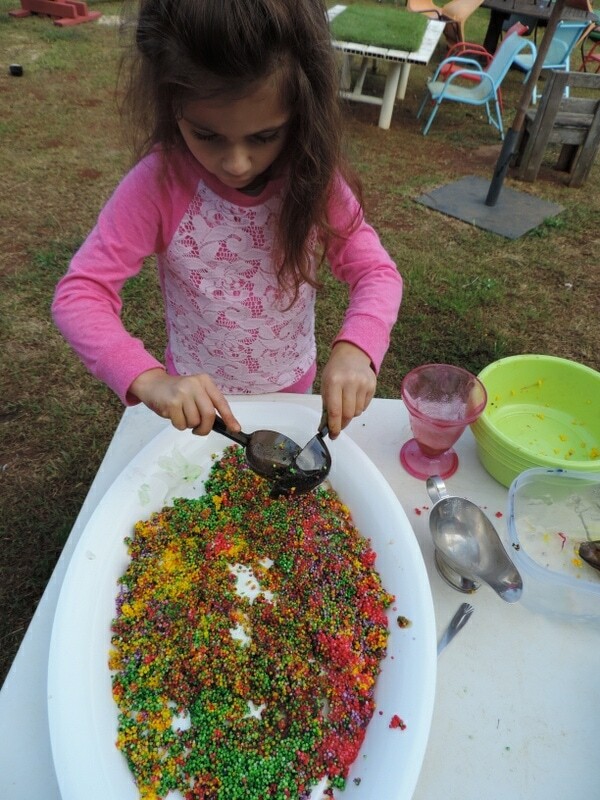 Have used water beads before, but more in the respect of a science experiment rather than sensory play and it was supervised not left standing around. Hi Lynne! I know using food in sensory play can be a delicate subject for many but I think it is about balance and using materials respectfully. I always try to use out of date food items for sensory play (I am lucky to have a partner who works in a food warehouse haha) and we get many uses out of the one item. Sometimes I believe food cannot be substituted as in the case of supporting children with certain texture aversions and sensitivities. 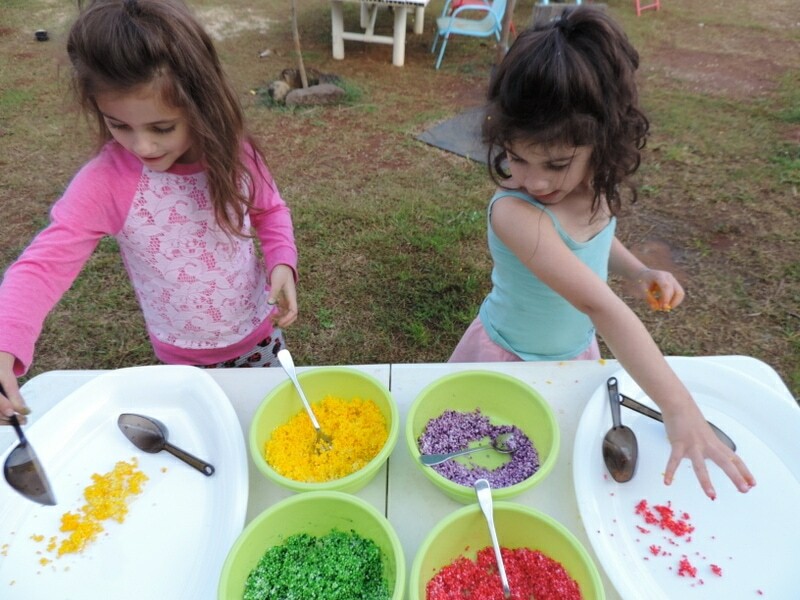 Sensory food play certainly helped my SPD challenged twin to overcome some of her fears of particular foods and was able to eat them because we had first played with them – it took many exposures and patience but it did work.I like to explain this side of things to centres and educators that are very critical of using food in play. I can’t wait to try this activity!